"How would you teach differently if you couldn't give students a test until a year later?" Information on this page includes educational resources that were presented to the Reuther Middle School staff during professional development and/or collegial conversations. Suggestions can be given for additions to the page. Getting Started With Thinking Routines - A list of 10 helpful suggestions for teachers who are getting started with Thinking Routines. 8 Cultural Forces - These forces define classrooms and provide goals for the environment we create. "This website is part of a three-year project inviting teachers from around the world to tell the stories of learning unfolding in their classrooms. These writings combine action research, assessment documentation, and personal reflection with a focus on thinking and learning." Thinking Routine Matrix - This matrix includes all 21 routines as well as a brief description of when, where, and how the routines are used. Understanding Map - Use this map identify the types of thinking/understanding you want your students to have in a unit/lesson. The map identifies the thinking supported by the visible thinking routines. 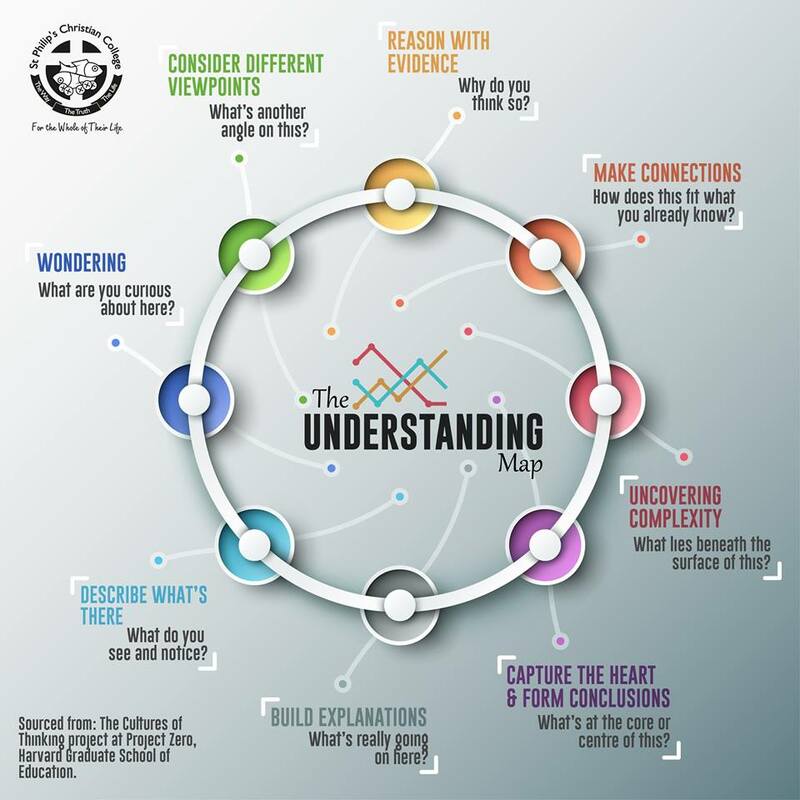 A new graphic design for the Understanding Map was recently created by St. Philip's Christian College. Visible Thinking Resource Book - This is a complete explanation of all of the thinking routines created by the Harvard Graduate School, includes the ones highlighted in the Making Thinking Visible book as well as the additional ones from their website. Depth of Knowledge chart - This chart helps to gauge the level of thinking you would like your students to achieve. National School Reform Faculty - On this site you will find a list of effective protocols that can enhance your instructional design. They are organized in logical categorizes, making it easy to locate a protocol related to your intended learning goals. LAST Protocol: Looking At Students' Thinking - A useful tool to help focus teachers' attention on student thinking. Slice Protocol - A protocol used to look at student work across classrooms and grade levels to gain insight on learning. Considering Evidence Protocol - A protocol for evaluating evidence for an action research project. MYST (Me, You, Space, Time) routine - This routine can be used to help teachers prepare and reflect on making thinking visible in their classrooms. Self-Assessment - This tool can be used to identify your (teacher's) strengths and weaknesses in promoting a culture of thinking classroom. Creating Powerful Learning Opportunities - These 4 criteria can be used in assessing the kinds of opportunities we provide for our students in Culture of Thinking classrooms. Thinking Move Posters - These posters contain the 8 thinking moves outlined on the Understanding Map. Print and use these posters as a tool to highlight the thinking students will engage in during a lesson or activity. Thinking Routine Posters - These posters contain the core routines along with the types of thinking that the routine requires. Print and use these posters as you transition the language of your classroom to be thinking-focused.